The Progressive Party of Maldives (PPM) has been fined MVR5,000 (US$324) by the Elections Commission (EC) for submitting a fraudulent membership form last year. According to the EC, the membership form was submitted on behalf of a dead person in violation of article eight of the Political Parties Act. The PPM has been asked to pay the fine in 15 days. Former President Mohamed Waheed has decided to join the ruling Progressive Party of Maldives (PPM) after his Gaumee Ihthihaad Party (GIP – National Unity Party) was dissolved by the party’s council. Waheed signed for the PPM at a special event attended by President Abdulla Yameen held today. Other members of the GIP’s leadership also signed for the PPM alongside Waheed. 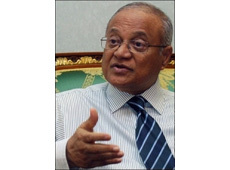 This includes his political advisor Ahmed Thaufeeq, State Minister of Education Abdulla Nazeer, former President’s Office Spokesperson Masood Imad, Maldivian High Commissioner in Sri Lanka Hussain Shihab, former Immigration Controllers Dr Mohamed Ali and Ilyas Hussain Ibrahim, Adnaan Ali and Jaufar Easa Adam. Waheed said his decision to join PPM is in the best interest of the nation at the current time. He praised PPM for winning “a very competitive and difficult election”, saying it is the PPM that is most capable of overcoming obstacles and facing up to challenges. GIP Council member Thaufeeq informed local media that the council members had unanimously made the decision to dissolve the party as they did not believe it wise to continue running the party in the present political and economic circumstances. “We agreed that the current political and economic situation makes it difficult for small parties to function here. We believe that dissolving the party would be beneficial to the nation and citizens as the state spends large amounts from its budget on funding small political parties,” Thaufeeq said. Waheed himself led the meeting attended by all ten council members of the party. Thaufeeq confirmed that the party would complete sending in all formal documentation needed to dissolve the party to the Elections Commission by Thursday. According to the Elections Commission (EC) website, the GIP – which was officially registered on September 4, 2008 – currently has 5864 signed members. The EC has sent a letter to all parties comprising less than 10,000 members notifying them that they will be dissolved within three months after the ratification of the Political Party Act in September. In March, when the draft of the political party bill was being discussed, several smaller parties began membership drives to reach the limit of 10,000 members, including the GIP, business tycoon MP Gasim Ibrahim’s Jumhooree Party and the religious conservative Adhaalath Party. Waheed’s GIP was accused of trying to induce people to join throughillegitimate means, in a bid to shore up the party’s membership base. The inducements included offering “music equipment and a place to play for free” as well as “hosting shows and parties” for young people. Apart from luxurious parties and entertainment, the GIP also allegedly promised highly paid government jobs and promotions in return for joining the party. President Abdulla Yameen Abdul Gayoom appointed six new cabinet ministers today including Umar Naseer as Home Minister, Sheikh Mohamed Shaheem Ali Saeed as Islamic Minister, Dr Mohamed Muiz as Housing and Infrastructure Minister, Dr Mohamed Shainy as Fisheries and Agriculture Minister, Mohamed Saeed as Economic Development Minister and Thoriq Ibrahim as Environment and Energy Minister. The oath of office for the ministers was administered by Supreme Court Justice Abdulla Areef. While two of the five ministers appointed on Sunday night were members of the President’s Progressive Party of Maldives (PPM), the new ministers appointed today were nominated by coalition partners Jumhooree Party (JP), Adhaalath Party (AP) and Maldives Development Alliance (MDA). 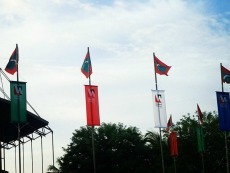 The PPM-led coalition also includes a number of smaller parties. JP Leader Gasim Ibrahim and MDA Leader Ahmed Shiyam Mohamed attended the swearing-in ceremony at the President’s Office this afternoon. Adhaalath Party members Shaheem and Muiz had served in the same posts in the cabinet of former President Dr Mohamed Waheed. In addition to the ministerial appointments, former Youth Minister Mohamed Hussain Shareef ‘Mundhu’ was appointed minister of the President’s Office – a post abolished in 2008 – and former Economic Development Minister Ahmed Mohamed was appointed Commissioner General of Customs. All cabinet ministers would require parliamentary approval for confirmation of their posts. In his remarks after presenting letters of appointment, President Yameen congratulated the new ministers and noted that the government was formed out of a coalition. The aim of the government should therefore be implementing the main components of the manifestos of the PPM-led coalition, he said. This would bring contentment and prosperity to the people, protect Islam, maintain peace and stability, and overcome divisions, Yameen said. The coalition government would be “a compassionate government” that “respects the individual rights of all citizens,” he added. President Yameen said he wished to “speed up our efforts” to deliver on the campaign promises and asked the new ministers to “work tirelessly” and “make sacrifices if necessary” to serve the public and defend Islam. “So I ask all of you to provide cooperation to me and my government to ensure the development the Maldivian people want,” he said. The next five years would bring “unprecedented joy and peace” if the coalition government’s vision for the country was realised, Yameen said. President Yameen said he hoped to present a timeline or roadmap for the first 100 days at the first cabinet meeting. Umar Naseer was dismissed from the PPM in April after refusing to apologise for allegations of vote rigging in the wake of his primary defeat to President Yameen. 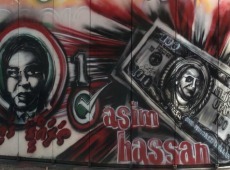 Naseer had claimed that Yameen “rigged” the primary by ballot stuffing, falsifying the count and “pouring black money” to buy votes. “Less than 24 hours after my brother Abdulla Yameen won the primary, the foremost person in the Maldives’ corruption network, Deputy Speaker of the People’s Majlis Ahmed Nazim joined the PPM,” Naseer had said. “The 40,000 illegal immigrants who have entered the country are people brought in under his nose. People say that there is a connection between Yameen and the illicit drugs that are sold on the streets of Maldives,” Naseer alleged. Following Gasim’s third-placed finish in the first round of the presidential election on November 9, Naseer declared that he would back the PPM candidate against former President Mohamed Nasheed. 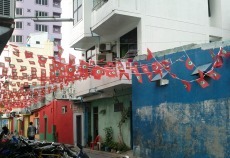 In the months leading to the September 7 presidential election, the streets of Maldives have erupted into a mosaic of party banners, with posters, flags, banners, and graffiti decorating every street corner. While it may seem to an onlooker that the amount of material each party has placed around the country represents the amount of public support they enjoy, some volunteers putting up the decorations suggest another side to the story. Party supporters are largely responsible for the colourful displays, but some parties are accused of spending thousands on hiring groups to help them keep up with the campaign craze, oftentimes spending large funds on the process. “We’re doing this for democracy. We don’t want any money or incentives for this. 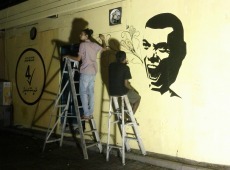 All we want is an elected government that cares about the people”, one group of young graffiti artists painting Maldivian Democratic Party (MDP) themed artwork in their neighbourhood told Minivan News. “The thing is, if we don’t get involved and try to guarantee a better life for ourselves, why would anyone else bother? I’m all for MDP, especially after the rest of the political lot brought about the coup d’etat. 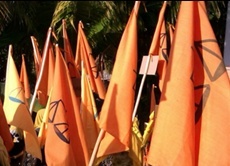 That is the ultimate shove of their boot against the people, a blatant admission from the ‘baaghees’ that they have no respect or concern for the common man,” said Ahmed Affan, a 26 year old man, an accountant who volunteers in his free time with a team hoisting MDP flags across the streets of Male’. Progressive Party of Maldives (PPM) teams also told Minivan News that they were voluntarily engaging in campaign decorating. “It’s ‘Zaeem’ [Supreme leader – referring to former President and Leader of PPM Maumoon Abdul Gayoom] who has done the most for our poor country. We will do whatever he wants of us. We are determined to have our candidate [Abdulla Yameen – half brother of Gayoom] have a clear win in the election, and we are spreading this message to as many people as possible,” said a 37 year old man hoisting PPM flags and putting up posters down a street in Galolhu. Aishath Zubaira, a 63 year old supporter of President Dr Mohamed Waheed, who has posters of her preferred candidate on the walls of her residence, says she supports him “with heart and soul”. While Minivan News spoke with two different groups streaming the streets with strings of small ‘Forward with the Nation’ coalition flags, they had contradicting reasons for doing so. “Waheed’s a capable man, and the majority of his supporters are mature and, well, kind of elderly to be honest. There are few young people like us who are aware of just how much Waheed can do for this country, so we need to come out and help make him more popular,” said a 43 year old volunteer, holding a dozen or so rolled up posters sporting photos of Waheed with his running mate, Dhivehi Rayyithunge Party (DRP) Ahmed Thasmeen Ali. Another man who appeared to be in his late twenties, who introduced himself as “Issey”, put up posters and distributed copies of the coalition’s manifesto. “It doesn’t matter which candidate’s campaigning I am doing, it’s not even like these ugly flags and photos will make a difference for any party,” he said. A 31 year-old man working at Ibrahim Nasir International Airport (INIA) told Minivan News – on condition of anonymity – that he works in one of Jumhooree Party (JP) coalition’s campaign teams of six to ten persons each. “When we finish putting up the strings of flags across a street, we need to ring a number that the party has given us. Then a party official will turn up with a file which has information on when and where the teams are active. They will put a tick confirming the job is done and pay us in cash on the spot. We get about MVR 3000 (US$195) a night on average,” he explained. According to local media reports, Police have arrested at least eight people for cutting off lines of flags of various political parties in late August, though police media officials were not responding to calls at the time of press for confirmation. Moderator Heena Waleed stated that the questions asked – concerning education, health and economy, development and social protection – were based on a survey done by the Maldives National University (MNU) on citizens’ concerns. The candidates included Gasim Ibrahim representing the Jumhoree Coalition – consisting of the Jumhoree Party (JP), Adhaalath Party (AP), Dhivehi Qaumee Party (DQP) and former PPM interim deputy president Umar Naseer and supporters, President Mohamed Waheed contesting as an independent candidate in coalition with the Dhivehi Rayyithunge Party (DRP) coalition, Abdulla Yameen representing the Progressive Party of Maldives (PPM) and Maldives Development Alliance (MDA) coalition, and Maldivian Democratic Party (MDP) candidate Mohamed Nasheed. 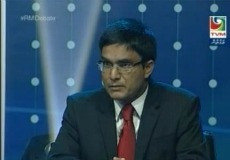 TVM also held a running mates’ debate on August 26. In their introductory statements Gasim, Waheed and Yameen spoke of the “deteriorating standard of living, torn up social fabric and the lack of peace and unity”, pledging to rectify these issues if elected. Waheed said that he had assumed power in very dangerous times – referring to 7 February 2012’s controversial transfer of power – “I will remain a faithful leader,” he pledged. Nasheed focused on reiterating the policies covered in MDP’s “Costed and Budgeted” manifesto, which was released on August 24. The first question posed concerned what changes would be brought to the education system, with the host claiming that many citizens felt that while the country followed the UK system, other South Asian countries had “far better systems with a higher pass percentages”. This was followed by asking how the candidates planned to increase the number of people interested to pursue a career in teaching. All candidates spoke of making arrangements to allow teachers to work on their islands of origin, to provide accommodation, and of introducing or continuing vocational technical training and higher education opportunities. The three candidates from the current government’s unity coalition also emphasised that building interest in the field depended on how much financial and other incentives can be offered, pledging to increase them. Gasim added that he will introduce Islam, Dhivehi and Quran as subjects, although all three are already taught in primary and secondary schools. He also said that all students in and above Grade 8 will be given a laptop and an internet connection under his government. Nasheed spoke of his previous three years in office, noting that he had introduced single sessions for 150 schools, built 243 classrooms, and worked towards increasing the the number of students who passed at least five subjects in GCE O’Level examinations. He said that if elected, his administration will continue these efforts while also training educators to conduct multi-grade teaching. Candidates were asked to name three steps that could be taken immediately to strengthen the country’s weakened economic status. 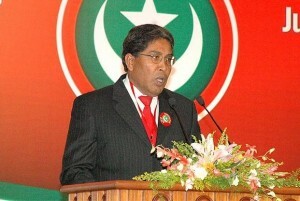 Gasim spoke of decreasing the deficit and establishing a tax system. Waheed highlighted the importance of broadening existing industries, claiming that he was currently holding discussions with foreign bodies to introduce new industries including financial and ICT services. He also claimed that he had brought down the budget deficit from 14 percent to 5 percent. “In the first two years we will make the budget zero or completely get rid of deficit. In the remaining three years there will be a budget surplus,” Yameen stated. Nasheed stated that his party’s aim is to decrease the difference between the rich and the poor, adding that this can be achieved through setting up a solid tax system. “It is very important to decrease debt. Although Waheed just claimed otherwise, our economic situation has been deteriorating ever since he brought about the coup d’etat. Debt is at 82 percent of GDP, there is a huge deficit, inflation is extremely high,” Nasheed retorted, adding that an MDP government would work to bring all of this back into balance again. While all spoke of how the difficulty of getting foreign currency in the country could be addressed through increasing foreign investment, Nasheed alleged that investors are reluctant to invest in the Maldives “after the coup d’etat and the harassment of investors following it, including sending our investors without any justification”. The US private equity firm bought both Maldivian seaplane operators, Trans Maldivian Airways (TMA) and Maldivian Air Taxi (MAT), in February 2013 for an undisclosed sum. All candidates pledged to establish sewerage and water systems on all islands. Asked about policies focused on permanently reducing costs of electricity, Waheed and Nasheed spoke of increasing the use of renewable energy. “While some people spend time acting in movies with the pretence of ‘protecting environment’ and managed to make no more than US$11 million available for renewable energy, in the past one and a half years I have raised US$200 million. I will make 30 islands run 100 percent on solar energy in the next two to three years,” Waheed claimed, referring to Nasheed’s documentary, the Island President, filmed while Waheed was serving as Vice President in Nasheed’s administration. Gasim also spoke of introducing solar energy, promising to “create power stations and then connect them with a grid through submarine cables or something like this. In order to bring down electricity prices, we will maintain the same price countrywide for wheat flour, rice and sugar”. All candidates except Nasheed spoke of establishing centres to care for the elderly. 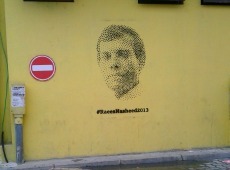 Nasheed’s proposal is to continue offering a pension to the elderly. “I plan to build rehabilitation centres for the elderly in the atolls, which can be managed with the cooperation of the community. The problem of elderly or of health can be dealt with through a sustainable insurance scheme,” Yameen said. Gasim said: “As Muslims, we see parents taking care of children, treating them like [the apple of their] eye. And we should return this care when parents grow old. Our manifesto also says we will provide health care through insurance or something so I have no worries about that,” Gasim stated. Waheed, meanwhile, pledged to increase the current monthly allowance to the elderly of MVR 2300 to MVR 3500, while Yameen said he will increase it to MVR 5000. “I have done as much work as anyone else here to bring democracy and I will protect it. But differing opinions can’t be an excuse to commit arson and murder. A lot of people even accused me of not wanting to hold elections, but look, we are having elections soon. I will remain a faithful leader,” Waheed stated. Responding to a question on what assistance would be provided to pre-schools if he was elected, Yameen said he would ensure that pre-schools stop charging fees. “An elected president must be someone who will spend all day, every day thinking about nothing but the country’s economy,” he ended. Gasim, asked about corruption and gang violence, among other topics, focused mostly on reviewing existing laws. He said he is of the opinion that corruption is lower in the private sector, adding that salary increments for government posts could be a possible solution. He also said that gang crimes can be dealt with by introducing legal frameworks into the school curriculum and offering rehabilitation to gang members, while better implementing legal action against gang crimes. 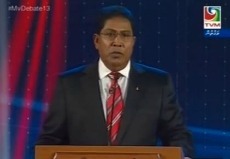 “I will do all possible to make Maldives into a country like Singapore or Dubai,” was Gasim’s concluding statement. Questions posed to Nasheed were regardingthe high level of corruption, separation of powers, and concerns that political activity and its broad media coverage has decreased national unity. “Some people feel that remaining behind an authoritative leader without asking questions is unity. But in the new constitution we adopted, there has to be differences in opinion. We must be able to conduct freedom of expression and freedom of assembly,” Nasheed began. Progressive Party of the Maldives (PPM) Spokesperson and MP Ahmed Mahloof has stated that the party is confident of winning the September 7 presidential election unless there are “major incidents” on the day. The party’s biggest concern was the chance that a large part of the electorate registered in polling stations other than those at their permanent residences may be denied the right to vote, he said. “We are confident that unless such a problem arises, or some major incidents are carried out on voting day, we can smoothly win the elections even if things carry on as now,” Mahloof continued. “Honestly, what worries us is that thousands from the electorate may be unable to cast their votes. However, the Election Commission (EC)’s Vice President [Ahmed] Fayaz has assured us at the last meeting we had that the EC will ensure no more than 50 people will be unable to vote due to any complications that may arise from re-registration,” he stated at a press conference held today (August 26). Fayaz today suggested that the PPM’s concerns may have resulted from them “somehow misquoting” what he had said to them during an informal meeting. Mahloof said although the party accepted that a low number of persons may be unable to vote due to unavoidable complications that may arise on election day, he felt it was better to air any concerns prior to polling day. “This country needs peace and calm. There will never be peace in this country if the day after the elections, a group comes out again, expressing dissatisfaction with the results, and commits arson and assaults,” Mahloof said. Mahloof declared that the PPM’s weekly survey showed the Maldivian Democratic Party (MDP) was rapidly losing the support it had previously had. The PPM poll currently predicts the PPM will receive 46% of the votes, the MDP 29%, the Jumhooree Party (JP) coalition 18%, and President Mohamed Waheed’s Gaumee Ihthihaad Party (GIP) just 7%. “If we consider the number of votes, MDP gets about 63,000 votes, PPM gets 103,000 votes, JP will get about 39,600 votes, and it looks like GIP will get approximately 15,000 votes,” he revealed. Mahloof claimed that these sudden changes in survey figures were a result of the electorate becoming aware of the policies of different candidates through various televised interviews. Mahloof went on to suggest that a drop in support may have been behind the MDP’s decision not to compete in Saturday’s (August 24) council by election held in the island of Nolhivaram in Haa Dhaal Atoll. “There are some very active and courageous MDP activists in that island, and yet the party head office in Male’ didn’t dare contest as it might expose the lack of support the party has now,” he alleged. Responding to Mahloof’s allegations, MDP spokesperson and MP Imthiyaz Fahmy stated that his party refused to take part in any election if it could not democratically select a candidate. “With the presidential elections this close, that is our main focus. We do not have time to hold primaries for a post in local councils that will only last for the next four months, as holding primaries is itself time consuming,” Fahmy said. Fahmy also dismissed the PPM’s survey as “baseless”, saying that few Maldivians were even aware of such a poll. “All the candidates have at one point or another agreed that MDP is leading the race. The debate they engage in is about which of them will come second in the elections. 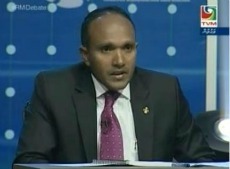 MDP has garnered even more support as more people are becoming aware of our policies,” Fahmy said. “MDP wishes to engage in competitive multi-party politics, and to contest in a free and fair competitive election. We are not the ones with a culture of attempting to win elections through bribery, vote-rigging or influencing the authorities,” Fahmy stated. “Look at the allegations PPM is levying against the EC… we suspect that they are voicing so many complaints about the EC now only because the commission is standing as a barrier between them and some underhand plans they may be cooking up,” Fahmy alleged. JP Spokesperson Moosa Ramiz meanwhile alleged that PPM press conferences were often used for “fear-mongering”, aiming to “create discord and unrest. “Although they’re working under a different name now – from DRP [Dhivehi Rayyithunge Party] to PPM – these are the same people who threw balls of fire at crowds and created havoc in 2008,” Ramiz continued. “As for those polls and surveys they speak of, we do not accept those results at all. They are just saying whatever works in their benefit, probably without even having actually conducted any research,” Ramiz said. “Although [Abdulla] Yameen appears to be the PPM candidate, it is actually [former President and PPM Leader Maumoon Abdul Gayyoom] who is doing the campaigning, and Maumoon who will be in pulling the strings. And we know who Maumoon is. He has remained two-faced, both when in power and now. He will appear all sincere and benevolent, but will be burning inside. Even now, with this survey, we see his habits on display, the habit of working in the interests of nepotism, doing whatever will benefit him, his family and those he considers ‘close’ to him,” Ramiz stated. “Jameel’s always throwing a fit, loudly proclaiming to put all his competition in jail for long term, or to flog someone, or to amputate someone, or something of this sort. He’s another man that the public no longer accept in the political arena. The poll they speak of is a farce. How can they have such support with men like this,” asked Ramiz. “Insha allah, the elections may turn out exactly opposite from what they have predicted,” he added. Gaumee Ithihad Party (GIP) Spokesperson Abbas Adil Riza was not responding to calls at the time of press. The Maldives celebrated Fitr Eid on Thursday, August 8 with Eid prayers at the Maafannu stadium, state organised parades, music shows, traditional games and vehicle-free streets. Several presidential candidates contesting in the September 7 presidential elections also organised separate events on the day. In celebration of Fitr Eid Male’ City Council, the Transport Authority and the Maldives Police Service declared that motorised vehicles would not be allowed to drive on the streets of the capital city Male’ and Hulhumale’ between 4-10pm on Thursday. A message tweeted by the official Twitter account of the police, which was later deleted, stated “Fitr Eid to be a day of no motorists so violators will be persecuted”, with an attached statement reading that any motorists driving without a special permit from the Transport Authority would be prosecuted under the Transport Act. According to Transport Authority records by late 2011 the number of motorcycles alone in Male’ – an island with an area of 5.8 square kilometres and populated by over 103,000 people according to a 2006 census – will be 42,062. Residents of the highly congested city anticipate the annual traffic-free event, and as a results the streets are filled with persons of all ages. Despite the cautionary announcements, Minivan News spotted a number of motorcycles and a large number of private cars on the streets during the time allocated for the ‘no vehicle’ event. In addition to this, Minivan News also observed three state vehicles accompanying President Mohamed Waheed’s coalition-organised walk with his political supporters. 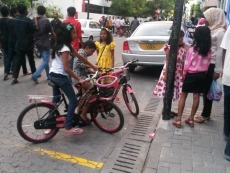 One incident observed by Minivan News occurred at 6.15pm on Medhuziyaaraiy Magu. In one instance, a white police van containing four male officers wearing the camouflage uniform of Special Operations forces drove down Medhuziyaaraiy Magu at 6:15pm at high speed without warning siren or flashing lights, swerving through about a dozen young children on toy vehicles and their families. Parents pulled children out of the way of the police van with seconds to spare and turned around and stared at the police van in shock. A number of parents started making comments about the “reckless behaviour” of the police force. The police van stopped about 12 feet away, and the four police officers stared back at the families. The officers spoke amongst themselves and seemed amused. When none of the gathered parents made any move towards the vehicle, the officers laughed loudly, waved and made gestures with their hands at the shocked pedestrians before speeding away in the same manner. “Look at the state the security forces are in. This country needs a complete overhaul of its systems. Leave aside protecting us from petty criminals, we need to first think of how to protect ourselves and our kids from the police themselves,” said another young mother. “Why bother having a traffic free Eid in name alone if the police are going to speed around crazily, if every government car is allowed on the street, not to mention half the private cars. This event is a farce, just like everything else in this country. Anyway, I spotted that police van’s license plate number, I’ll see if the Police Integrity Commission has anything to say about this,” another pedestrian added. A police media official told Minivan News that “police will always keep foremost a concern for public safety, even if trying to reach a crime scene as quick and possible”, adding that such incidents would not occur. Once the license plate number was shared, the official denied that the said police van had been on the streets at the time of the incident, adding that he would look into it. According to police, 41 people were fined for unauthorised use of vehicles. Following Eid prayers, President Mohamed Waheed Hassan, former President Mohamed Nasheed and former President Maumoon Abdul Gayyoom separately met with citizens to exchange Eid greetings. President Waheed received people at the former Presidential Palace of Muleeaage, and was accompanied by First Lady Ilham Hussain. Former President and Leader of Progressive Party of Maldives (PPM) Maumoon Abdul Gayyoom held an Eid greetings event at Nasandhura Palace Hotel. In addition to his wife, Nasreena Ibrahim, PPM’s Presidential Candidate and Gayyoom’s half brother Abdulla Yameen and his running mate Mohamed Jameel Ahmed also joined him in greeting ministers, former state officials and members of the public. Former President and Presidential Candidate Mohamed Nasheed conveyed Eid greetings outside Bandaara Mosque directly after joining Eid prayers. During the allocated traffic free hours, both President Waheed and the Jumhooree Coalition’s Presidential Candidate Gasim Ibrahim held separate walks on the streets of Male’ with their supporters. The Jumhoree Party also organised an “entertainment afternoon” for children as part of the party’s Eid celebrations. While a large crowd gathered in Henveiru for a grand ‘Eid Show’ organised by local telecom operator Dhiraagu, a number of smaller celebrations were broken up by police. An attendee at a show held on Fareedhee Magu told Minivan News that police had split up their show, with one officer stating that it was “un-Islamic” to enjoy music and dancing on Eid. A traditional game on Eid is called ‘fenkulhi’ [watergame], where coloured water is thrown at each other by friends and neighbours. The game was played at a number of locations around Male’, with one photo circulating on social media showing MDP candidate Nasheed joining a group of youngsters in the game. An eyewitness told Minivan News that one such group playing in Maafannu ward of Male’ was ordered by police to stop playing the game. He also alleged police had “roughed up the boys unnecessarily”. A police media official denied any such incidents. “I don’t think anything like that happened. I mean, there are no records of such events,” he said.